For the convenience of the driver, it is equipped with SiriusXM Traffic and Travel Link. You'll be able to get voice-guided navigation and use a variety of maps to get you to your destination in a hassle-free manner. The Ford Escape also comes with SiriusXM, providing you with access to more than 150 channels of music, sports, entertainment, and news. Everything will be easy to use with the in-dash screen. 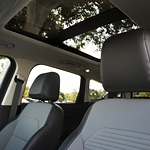 To provide as much natural light as possible, the Ford Escape comes with a Panoramic Vista Roof. Not only does this give everyone in the car amazing views of the surroundings, it also can be opened to increase air flow.